BEI Sensors 01002-8720 H25 Rotary Incremental Encoder, XH25D-SS-1024-ABZC-28V/V-EM18, Heavy duty 2.5" diameter square flange mount, 1.25" diameter pilot and 3/8" diameter shaft,2000 ppr, 2.5"
The H25 is the flagship of the BEI Sensors product line. It was designed from the ground up for the industrial marketplace. The H25 offers features such as EMI shielding, 40 lb. Abec 7 bearings, matched thermal coefficients on critical components, and custom high efficiency optics. The encoder meets NEMA 4 and 13 requirements. Typical applications include machine control, process control, the wood processing industry, oil well logging, industrial weighing, agricultural machinery, textile equipment, web process control, robotics, and food processing. 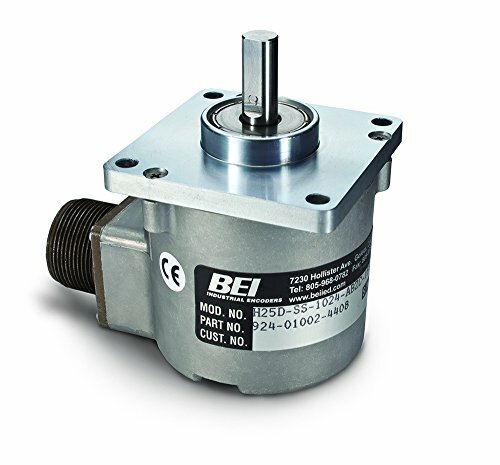 BEI Sensors 01002-7762 H25 Rotary Incremental Encoder, H25D-SS-2500-ABC-28V/V-SM16, Heavy duty 2.5" diameter square flange mount, 1.25" diameter pilot and 3/8" diameter shaft,2500 ppr, 2.5"
BEI Sensors 01002-7680 H25 Rotary Incremental Optical Encoder, H25D-SS-2048-ABC-28V/5-TB, Heavy duty 2.5" diameter square flange mount, 1.25" diameter pilot and 3/8" diameter shaft, 2048 ppr, 2.5"
BEI Sensors 01005-1311 H25 Rotary Incremental Encoder, XH25D-SS-5000-T2-ABZC-28V/V-SM18, Heavy duty 2.5" diameter square flange mount, 1.25" diameter pilot and 3/8" diameter shaft, 5000 ppr, 2.5"
BEI Sensors 01005-1185 H25 Rotary Incremental Encoder, XH25D-SS-12,500-T5-ABZC-28V/V-SM18, Heavy duty 2.5" diameter square flange mount, 1.25" diameter pilot and 3/8" diameter shaft, 10000 ppr, 2.5"
BEI Sensors 01002-8460 H25 Rotary Incremental Encoder, XH25D-SS-2000-ABZC-28V/V-SM18, Heavy duty 2.5" diameter square flange mount, 1.25" diameter pilot and 3/8" diameter shaft,2000 ppr, 2.5"